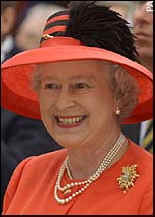 This weekend was one of the most eventful of all as the UK celebrated the Queen's Golden Jubilee and also the World Cup! The despite the bad weather the show went on in Southport and Formby with every one in high spirits. We hit the streets of Formby to capture the mood. Click here for the weekends pictures and also hear what people said! They got Married and already got stuck! Happy Birthday To Edmund from Patrick, Mum and Dad and the dog! Happy Birthday Anna from Pam Whelan for the 30th of May! Now 21 and the party was brill. UK office hours only, calls maybe recorded. PLEASE NOTE! Southport Reporter is part of PCBT Photography and is the news service provider for Southport.GB.Com Ltd.
Picture of the Queen with thanks to CNN.